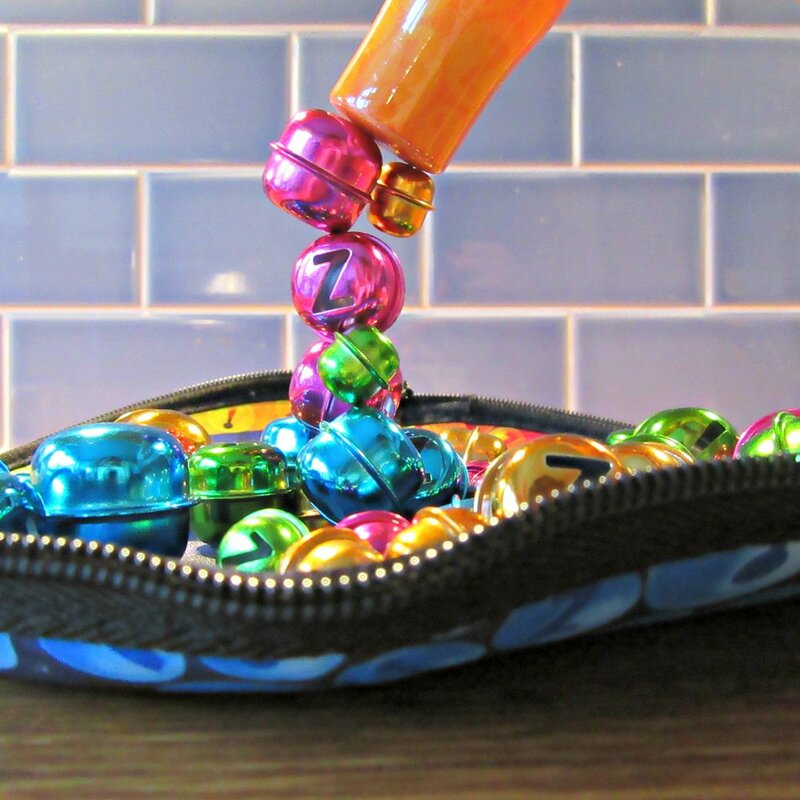 Bellz is a portable and addictive magnetic game for anyone aged 6+. This simple yet addictive game can be taken anywhere in the pouch which doubles up as an arena for your game. Ready to play and ready to go anywhere at any time. Well, I wasn't sure what this little rattling box was when it came through my door from Spin Master, in fact I had never heard of this little gem of a game and so I was all over working out what you were supposed to do with it. It only took me a few seconds to grasp, it is that easy, however it is skill based and therefore not as easy to master, which for a perfectionist like me, makes it addictive. The box comes with a travel pouch for storage that, when opened up, doubles up as an arena for your Bellz match. You pick a colour (Metallic green, pink, blue or gold) and use the magnetic wand to pick up the different sized bells. BUT if you pick up a colour that isn't yours, you have lost your turn and you have to hand the wand over to your component. The wand has two ends, a powerful end, which can pick up more than one bell at a time, or a weaker end for more precise pickings. You have to work out what end will keep the other colours at bay, it's harder than you think. The person who picks up all of their colour first wins. Simple as that. This game promotes precise hand movements and coordination, which for our Kyd is quite a challenge. However, this game is the perfect way of perfecting that and therefore will be brought out sneakily in order for me to make him practice his hand eye coordination. I will let him take it into his special needs school to let them have a look too, I reckon they may be ordering themselves some too. box contains: Pouch, magnetic wand, 40 custom bells in 3 sizes and 4 colours. Keep wand away from electronic and medical devices.